A. Railroads—the “engine” of economic growth by the mid-19th century, but also caused a great deal of disruption in the neighborhoods that the trains passed through, particularly in this time before the grade the railroad tracks ran on was elevated. 1. Injuries to children—in these neighborhoods, children were regularly injured or killed because they were hit by a train. 2. Injuries to railroad workers—working on a railroad was very dangerous work, and workers were regularly maimed or killed, particularly working in the rail yard, coupling and uncoupling rail cars. 3. Watered stock—in this period of rapid expansion, railroad companies often sold more stock than they had assets or profits to cover; or the board of directors might issue themselves more stock to stave off (or profit from) a merger with another company. This was known as “watering” the stock, and was a huge problem for investors not on the board of directors. 4. 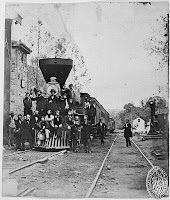 Depression of 1873—caused in large part by the bankruptcy of Jay Cooke & Company, a Philadelphia investment bank financing the initial construction of the Northern Pacific Railroad. This depression lasted until 1879. B. The Great Upheaval—the continuation of the depression meant that businesses continued to cut wages and workers, particularly in the railroad industry. 1. Martinsburg, WVa—a critical junction of the Baltimore and Ohio Railroad. Workers there decided to strike to attempt to force the company to rescind yet another wage cut in the summer of 1877. 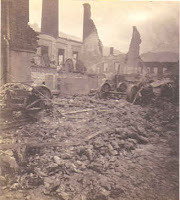 Workers prevented trains from passing through Martinsburg, despite the effort of the governor of West Virginia to mobilize the state militia. Workers also used their knowledge of and access to communication technology to workers around the rest of the country. 2. Pittsburgh—inspired by news of events in Martinsburg, and facing similar wage cuts, railroad workers in Pittsburgh went on strike against the Pennsylvania Railroad. When the militia was called up, they chose to bring troops from Philadelphia, were the Pennsylvania Railroad was headquartered. The arrival of this force of “outsiders” sparked a violent confrontation that eventually saw dozens killed, hundreds seriously injured, and much of the huge rail yard in Pittsburgh destroyed. 3. Toledo—In Toledo, agitation for an 8 hour workday for a minimum $1.50 a day wage led a number of workers, inspired by the job action of local railroad workers, to march from manufacturer to manufacturer to ask that the owner concede this demand—and to call for the workers to join the strike if the owner declined. That evening, a cache of arms stored since the abortive Fenian Uprising ten years before helped the local militia of business owners put down the rebellion. 4. St. Louis—inspired and aided by railroad workers, the workers of St. Louis actually engaged in a brief general strike, and workers for a time took over the governance of the city. 5. San Francisco—the Workingman’s Party in San Francisco was largely an instrument of anti-Chinese agitation, and the uprising there quickly degenerated into an anti-Chinese pogrom. 6. Chicago—inspired by the fiery rhetoric of Confederate veteran Albert Parsons and a number of German-American followers of direct-action anarchist Johann Most, workers in Chicago closed down railroad lines, and much else in the city, as well. 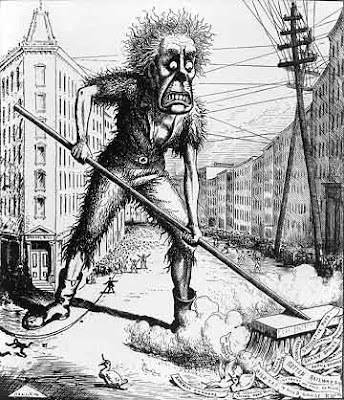 Although there was not a general strike here as there was in St. Louis, workers sympathetic to the radicals in the Workingman’s Party (in Chicago, this meant the anarchist contingent) regularly struggled against employers in the city—as well as the police force that workers saw working for business interests in the city. A. Economic climate—by early 1878, the US economy began to recover from the depression, and there was a brief period of economic growth—and labor quiescence—before the next depression hit in 1883-1884. 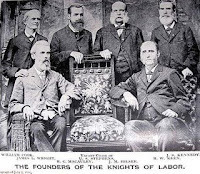 B. Knights of Labor (K of L)—founded by nine tailors in Philadelphia in 1869, in the organization’s early years of existence it functioned more as a fraternal organization than a labor union; it eventually emerged as the first general labor union in the United States, however, and attempted to organized all workers in the country without regard to gender or race (with one important exception). 1. Emergence—the K of L emerged in the late 1870s under the leadership of Grand Master Workman Terrence O. Powderly, a former railroad worker. The K of L organized workers into “local assemblies,” which could be based both organized by community location, or by craft. 2. Powderly’s claim—Powderly’s claim to abhor strikes was probably genuine, by the K of L was most successful in organizing workers by leading them into successful strikes. 3. 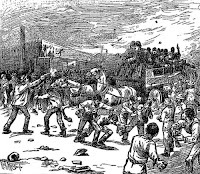 1885 Southwestern Railway strike—the most successful of the Knight’s strikes, which led to unorganized workers seeking out K of L organizers to join the union. C. Federation of Organized Trade and Labor Unions (FOTLU) – a rival group to the K of L, consisting of skilled trades workers organized by craft. To set itself apart from the K of L, FOTLU began agitating for a standard 8-hour day in all trades and industries by May 1, 1886. 1. Strike at McCormick Reaper—in late April, workers went on strike for higher wages and a standard 8-hour day at the large factory in Chicago. 2. May Day—May 1, International Workers’ Day, FOTLU called for a one day general strike. 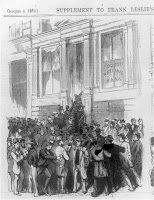 A parade of several thousand marched up Michigan Avenue; after the festivities downtown, some workers ended up at the McCormick works to show support for the strikers there. When a sizable contingent of strike supporters showed up again the next day, the police were called out to maintain order; in a confrontation, the police fired on the crowd, killing several. 3. August Spies—in reaction, the editor of the leading German language newspaper called for workers to attend a protest rally at Haymarket Square the next evening—and he advised them to come armed. 4. 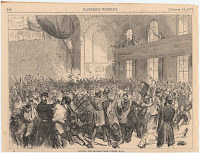 Haymarket Riot—in dismal weather, a small crowd gathered on the evening of May 3, 1886 to listen to a serious of speeches. As the evening was winding down, a contingent of Chicago police arrived on the scene to ensure the crowd left quickly and peacefully—when someone from the fringe of the crowd through a bomb that landed in the midst of the police. The combination of the bomb blast and the ensuing gun battle caused seven police officers to be killed, and a number wounded. Reliable numbers for the crowd have never been compiled. 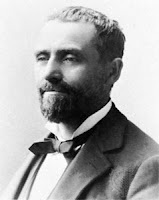 A. George Pullman – made his fortune hauling Chicago out of the muck; after the Great Fire of 1871, efforts were made to raise the remaining buildings as much of the swamp that the city was built on was filled. Pullman used this money to establish a company to build sleeping cars used on long trips by railroad companies. 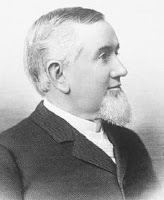 B Town of Pullman – as the company grew, Pullman became concerned about the effect the radicals in Chicago were having upon his workers, so several miles south of the city he built a town (housing, stores, public buildings, a hotel he named after his daughter Florence, even churches) which he rented to workers, but which he retained title. 1) “Model” town – Pullman the town was a great example of welfare capitalism—that is, subsidizing certain amenities for workers so they remain satisfied on the job. 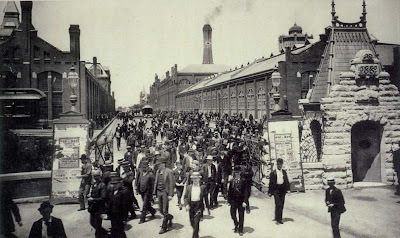 2) Depression of 1893 – the economic depression of 1893 cut deeply into the profits of the Pullman Company, and Pullman responded by cutting wages and laying off workers, as any good capitalist would do. (a) Pullman rents – Pullman refused to cut rents in the same manner, however, since that division of the business had to show a profit as well. (b) Pullman workers respond by going on strike in the spring of 1894. 1) Railway “Brotherhoods” – each specialty in the railroad industry had its own union, The Brotherhood of Railway Engineers, Brakemen, Conductors, Firemen; problems arose when railway companies settled with one of the brotherhoods, and they crossed the picket line while others were still on strike. The ARU is meant to be a solution to this problem. 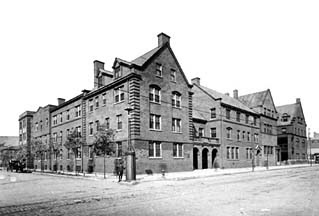 2) 1894 ARU convention – was held in Chicago; a delegation of workers from Pullman, who plead for the assistance of the ARU. Despite Debs opposition, convention delegates vote to assist Pullman workers, and vote to boycott all trains with Pullman cars. Despite the fact that the ARU represents a relatively small number of workers, traffic all over the country is interrupted. 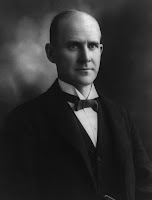 3) Government response – because there was little violence accompanying the strike the federal government was hamstrung; with a sympathetic John Peter Altgeld as Illinois governor, there was little chance that federal aid would be requested. (a) Richard Olney – the AG for the federal government was a railroad attorney, and it was he who suggested attaching Pullman cars to mail trains (interfering with the mail is, of course, a federal offense). (b) Troops from Fort Sheridan (and the Dakotas) are called in “to keep the peace,” which allowed the strike to be broken. 1. Labor Sympathizer--from the opening of Hull House, Jane Addams opened the doors to labor union leaders, who she saw as a vital cog in organizing working-class communities--the very kind of community she had decided to settle in and assist in bringing into the democratic fold. 2. Reliance Upon Conciliation--Addams was an early proponent and member of the Civic Federation when it was formed in Chicago in 1889; upon her joining the organization she sought to join the labor committee. Within this committee there was unanimity in the belief that the conciliation process should be used to settle labor/management disputes. How this process was put into practice left much to be desired. 3. Pullman Company's Refusal to Take Part--management at the Pullman company refused to take part in the process, despite the willingness of local union officials to engage with the company on these terms. B. King Pullman--Addams wrote an account of her experience in the Pullman Strike in which she compared Pullman to Shakespeare's King Lear--someone who had great power, but squandered it because he forgot the good he could do with it. In Addams' analysis, this analogy went further, to include Lear's two greedy daughters, who attempted to denude Lear of his entire kingdom, as filling the role that Pullman's workers and the ARU played in this tragedy.